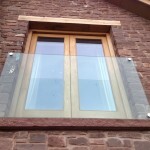 A Juliet balcony will enable you to add light and ventilation to your property and at Acorn Glass we are able to design, manufacture and install Juliet balconies to suit your requirements and create a distinctive appearance to your property. 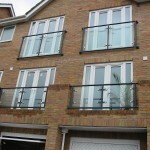 The Juliet balconies we install are securely fixed to the external structure to prevent someone from falling out of the building and offer a safe and secure balustrade system. Our Juliet balconies can be provided with minimal, or no obscuring of vision from its supporting members; all dependent upon the location in which they are to be installed. They are available in a variety of shape, sizes and finishes to meet your desired requirement. 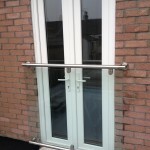 A Juliet balcony is virtually maintenance free, are suitable for coastal corrosive locations and following design calculations applicable to the region they will be installed and property use, they will meet all current building regulations and safety requirements. Whilst providing you with this mandatory and safety element Acorn Glass can provide you with a variety of aesthetically pleasing options to choose from. Juliet balconies will greatly increase natural light and ventilation to your room and will additionally act as a guardrail to prevent falls. Juliet balconies are permitted to be leant against, but not stepped onto.